After the player completes their registration on the page and secures the necessary credits, they are ready to participate in one or more tournaments. Alternatively, before purchasing, they can participate in free entry tournaments or use credits he has received free of charge upon signing up to buy an entrance ticket to a tournament. "Our advice is to select a free or low entrance ticket tournament first until you know better how to conduct a tournament." Let's take a first look at the platform and get to know how BMARENA works. On the ARENA page, each player will select the competitions they wish to participate in, place their bets and keep track of the progress of the ranking until each contest is completed and the winners are announced. TABLE C : In “INFO” We can see information about the tournament, start time, end time, ticket price, number of entries and winner prizes. In the second field “ BET SLIP “ are placed the bets we chose from Table B. In Table Α we will find the various tournaments in which we can register and participate if the number of entries has not been reached. the number of players. There are tournaments of 6 players, 10, 20 and ( UNL ) with unlimited entries. the prizes (could be splitting money from player registrations, or there could be an extra sponsor that will contribute to earnings by increasing dividends or even a minimum amount of winnings, regardless of the number of entries where players can again share an amount sufficiently greater than that derived from registrations. At the top of table A there are two tabs. ALL TOURNS . By selecting this we see a list of all available tournaments. MY TOURNS . By choosing this we only see the tournaments we are participating in. 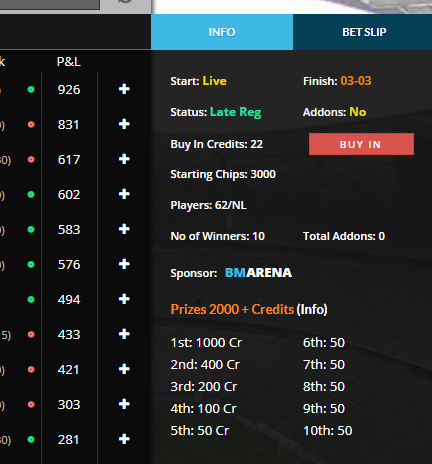 After selecting a tournament from Table A (Figure 1), it receives a yellow background, while at Table B we can see the matches and the prices, the ranking of players and our bets and in TABLE C we can see all the information about this tournament. In its first column there is “ time “ we see in what phase the tournament is in time if it is in progress, etc. Note that given that there exist betting matches, players can participate in the tournament unless there is the indication “ close “ which means that tournament entry has been closed. The second column is the name of the tournament “ Name “. The name usually includes some useful information about matches relating to the duration or prizes of the winners. In the third column: “ Buy in “ : In this column we see the ticket price. In the fourth column: “ Plrs “ We see the number of players in the tournament. For example, 4/6 means that it involves a tournament of 6 players, in which 4 of the seats have already been occupied and consequently there are two available seats. On the fifth and the final column we see the amounts that the winners will share “Prizes “. TABLE B Presentation of matches, prices, player ranking and betting. 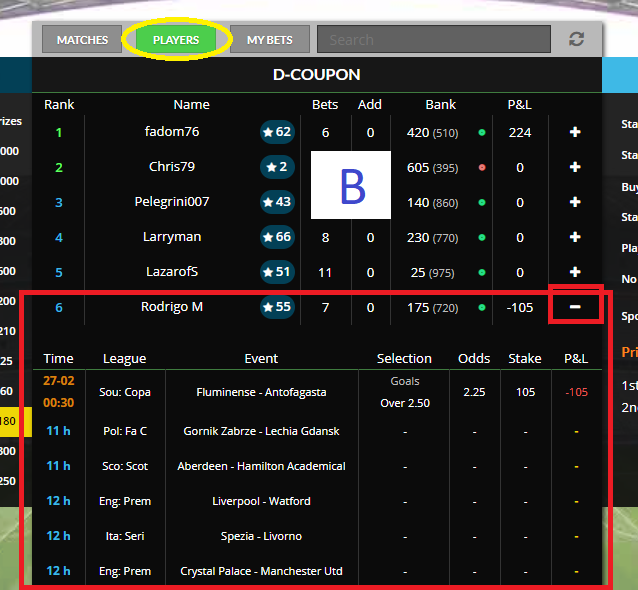 In Table B, we can see match prices, player rankings and our bets. Also, from this table we will choose our bets to the contest's matches. First, we select a tournament from table A, after doing so the tournament receives a yellow background , then we see in Table B the matches in which the players will compete and place their bets. Specifically, the three tabs of Table B show the following. 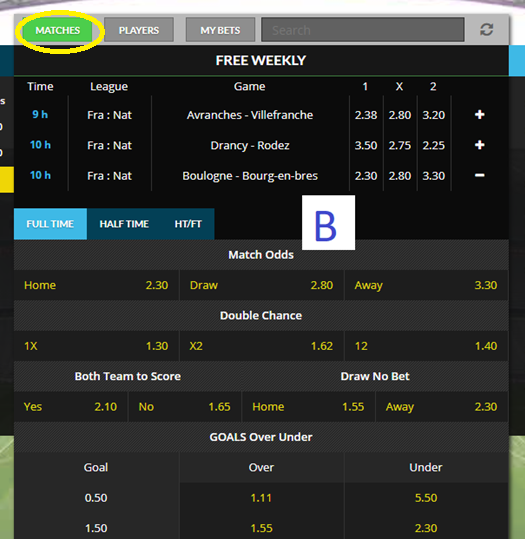 “ MATCHES “ ( picture 1 ) By choosing this we see the available betting matches and by clicking on (+) we see all available purchases and prices. 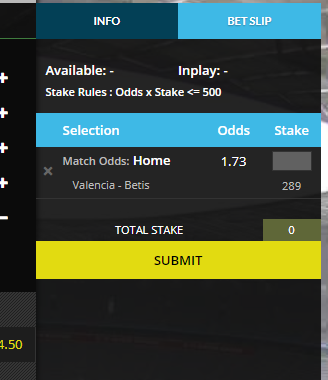 By pressing a value, a betslip is created on Table C where we place the stake and bet. All our bets are SINGLE BETS. At the end of the matches list there is a live presentation of the results of the matches that are in progress. 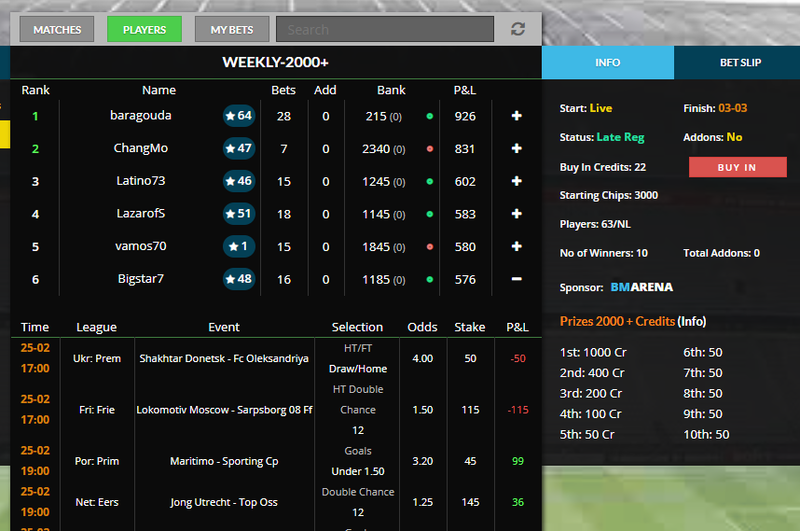 “ PLAYERS “ ( picture 2 ) With this option we see the players participating in the tournament, their ranking throughout the tournament progress and their P&L up to that moment, while by pressing + in their bets we see if they have bet on any races. Their exact bets appear a few minutes after the start of each match as to avoid bet copying and strategic bets. “ MY BETS “ With this option we see our stakes in the tournament as well as the results of those that have been completed. ( Status ) The status of the tournament now, if it's in progress or has finished. ( Starting Chips ) Starting pot the players receive and which they will use for bets in single matches. ( Players ) Number of players who have registered : Above we see that 62 players are already participating and unlimited players can enter. 64/UNL. ( Prizes ) We see the winners' winnings according to their position. Profits increase as registrations do and there are also tournaments with guaranteed minimum winnings as well as with a boost on profits from a sponsor. We see the bet placement field. By clicking on the price of the purchase we chose, this field is created automatically and all that remains is the stake, i.e. the amount of the bet. Below the field we see the maximum amount we can bet on this option. Then follows a typical confirmation of our selection and the bet is registered on my bets. By choosing a tournament from Table A we see the information in Table C and choose the one we want to participate in. 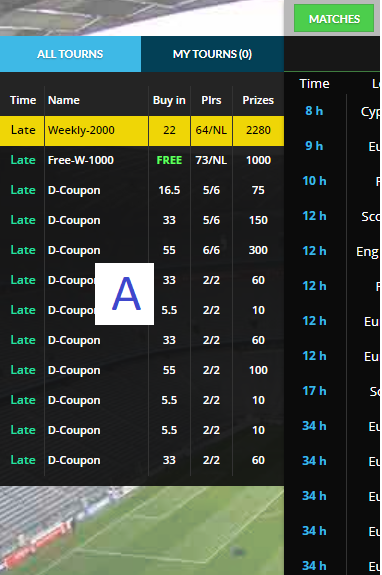 Suppose that we chose the weekly -2000 tournament in table A and we see that it has the yellow background. Then on Table C we see all the tournament information as described above. 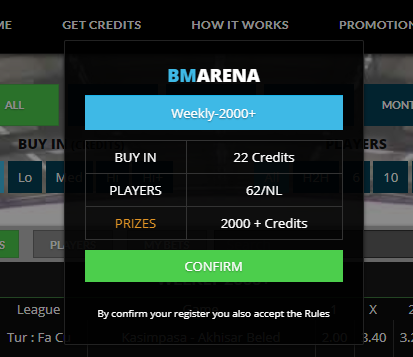 In clicking BUY IN the system asks for confirmation that you want to subscribe to the weekly -2000 tournament and the ticket cost is 22 Credits . By pressing " CONFIRM ", 22 credits are deducted from our credis account and our registration in the tournament is completed. We repeat the process every time we want to place a bet. In this table we can observe the progress of the tournament by selecting TAB PLAYERS on the top of the TABLE B. Add It shows if the player at this tournament can by one or more extra banks during the event. Also you can see if he has bought a new or more banks until now. Bank Their available playchips and in parenthesis those he has bet and have not yet been completed. , This shows which players have bet more than 50% of their playchips, which is also the minimum of the playchips a bettor use to consider an entry as valid. P&L The net profit from the so far completed bets. By clicking on it we see the bets they have placed so far.